We awoke before sunrise. It was all quiet in the dimly lit hotel. In spite of the lack of sleep, wakefulness gripped us immediately courtesy of the nervous anticipation coursing through our veins. Minutes later, we grabbed our packs and left; we’d packed the night before and there was nothing left to do now except hit the road. The airport did not inspire Mandy’s confidence (always in short supply when flying). 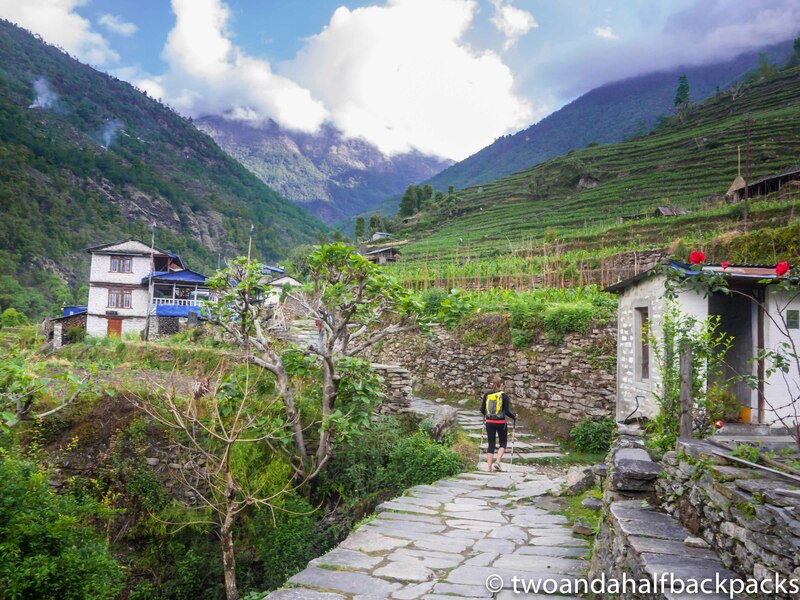 The aging building with crumbling brick facade and faded interior housed a mob of fellow trekkers awaiting outbound flights to remote Himalayan outposts. 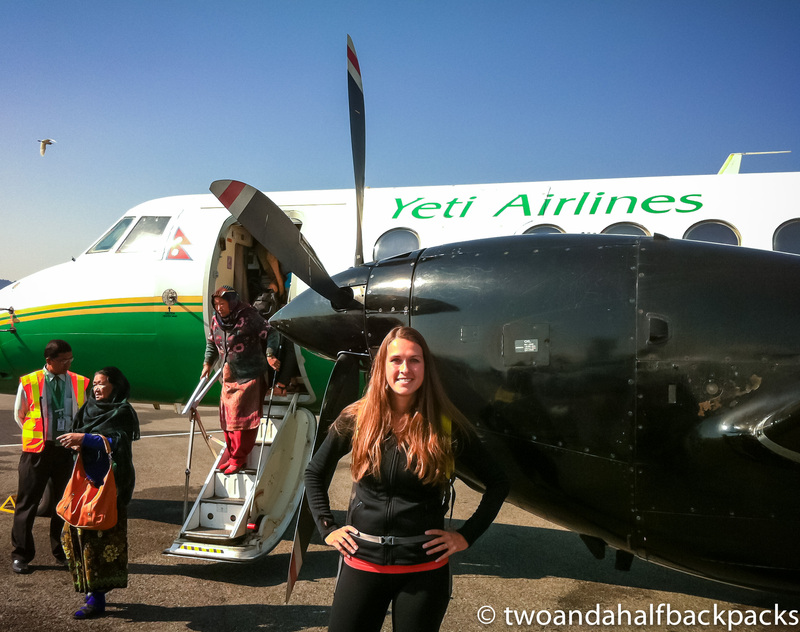 Warm sunlight filled the sky as we squeezed aboard a dated turboprop plane alongside twelve other passengers. With a whir of propellors, we soon hummed noisily above the clouds, a tiny speck of metal in the bright blue sky, bouncing up and down on air currents diverted by the massive snowcapped peaks surrounding us. 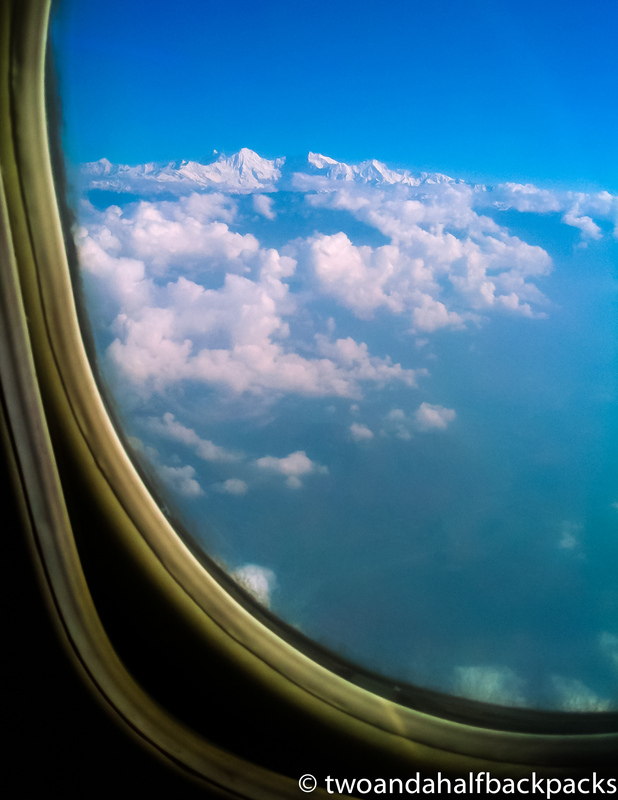 A short twenty-five minutes later we touched down smoothly in Pokhara. Mandy smiled. 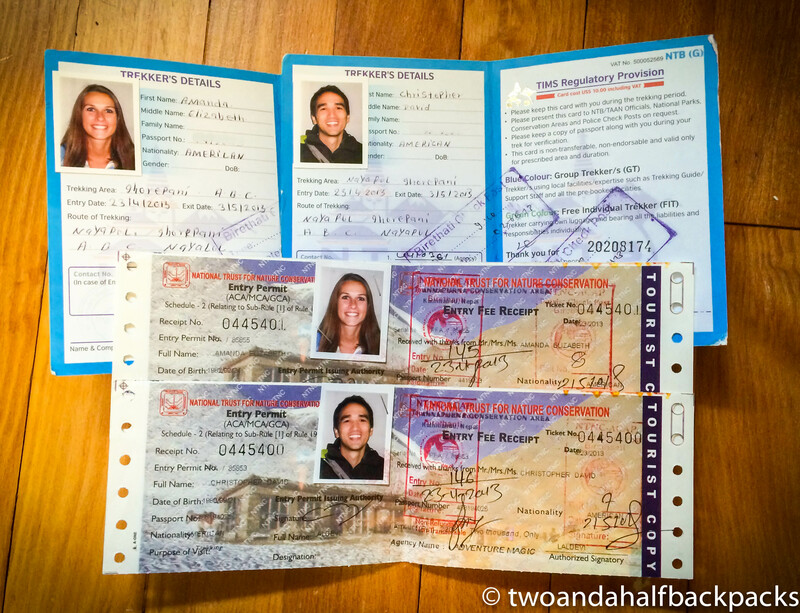 In Pokhara, we met up with Dende, our Sherpa guide, and Urchin, our porter. We had hired a guide to provide insight into the local culture and customs, but we were not expecting a porter, which led to an awkward few minutes. Carrying our own backpacks has always been a point of pride; we had packed light and had nothing to give Urchin to carry. Finally, we handed over our sleeping bags and he stowed away the rest of Dende’s gear in a large duffel bag. I soon realized that Urchin was not being paid at all, but had shown up hoping to work for a tip. It’s a bit of a ruse, but we would appreciate his company. Though soft-spoken, he had a reassuring presence and a knack for being in the right place. His steadying hand saved both Mandy and I from falls on occasions when we abruptly lost our footing scrambling across scree and loose boulders. Introductions completed, we obtained our trekking permits and national park passes before beginning a tortuous drive to Nayapul. Our driver hurtled up the road with little thought for our safety, or the safety of the people who lived there. We flew past ramshackle towns, the scenery dusty and dirty. At the trailhead, we piled out, carsick but alive, overwhelmingly relieved to be liberated from the madman’s vehicle and back on our own two feet. The inauspicious beginning continued. Dende had forgotten to bring the set of hiking poles he’d promised Mandy, heightening our fears that she might be unable to complete the entire route (which features some brutal climbs and descents) on her painfully swollen right knee. We stood in the middle of the trail, actually still a roughly hewn road at that point, traffic and all, and pondered our next step. 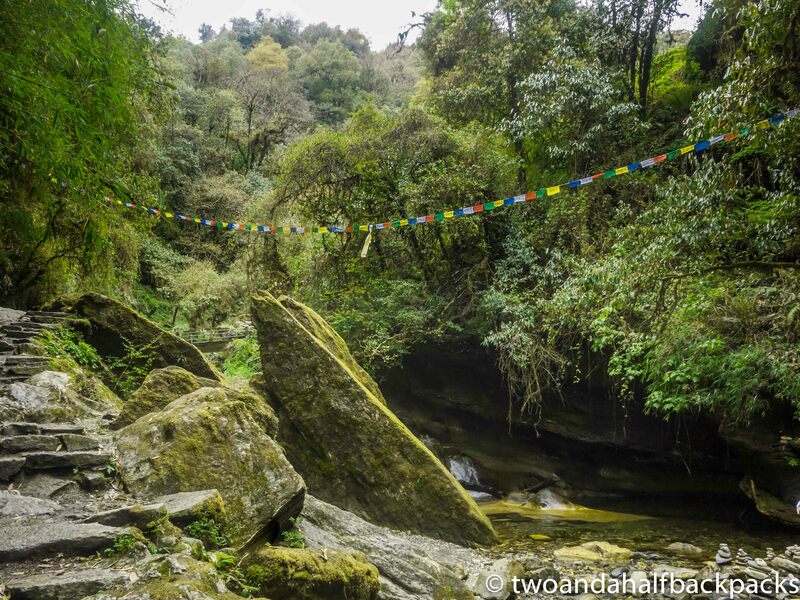 It was far from the pristine Himalayan scenery we’d expected and we were rapidly losing faith in Dende. Then, the grey skies opened and it began to rain heavily. We hurried to a teahouse, where we took shelter from the rain and shared a soggy tomato and cheese sandwich for lunch. 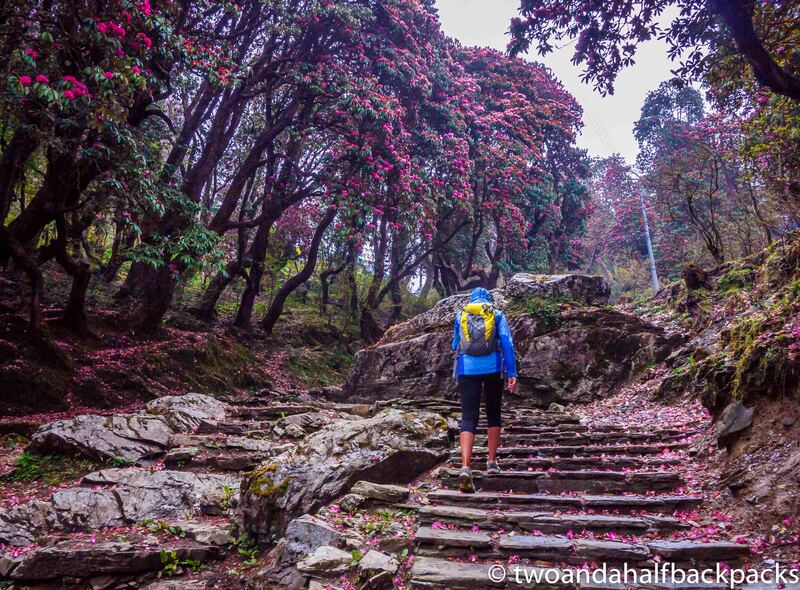 “You know, if we turn around now, we could be back in Pokhara this evening,” I thought out loud, as I mulled 10 challenging days of muddy trails, dreary rain, and icy nights. Mandy looked back at me, also clearly tempted by the thought. While it’s easy to smile now as we reminisce on our trials and tribulations, they were not quite as endearing at the time. In that cold and wet moment, the simple luxury of a warm, dry room and a long night’s sleep in an actual bed held an unbelievably strong appeal. Outside, the rain died down and the thought vanished…mostly. Our spirits rose (they couldn’t have sunk much lower) as we continued on, the road became less traveled and small farms dotted the hillsides. 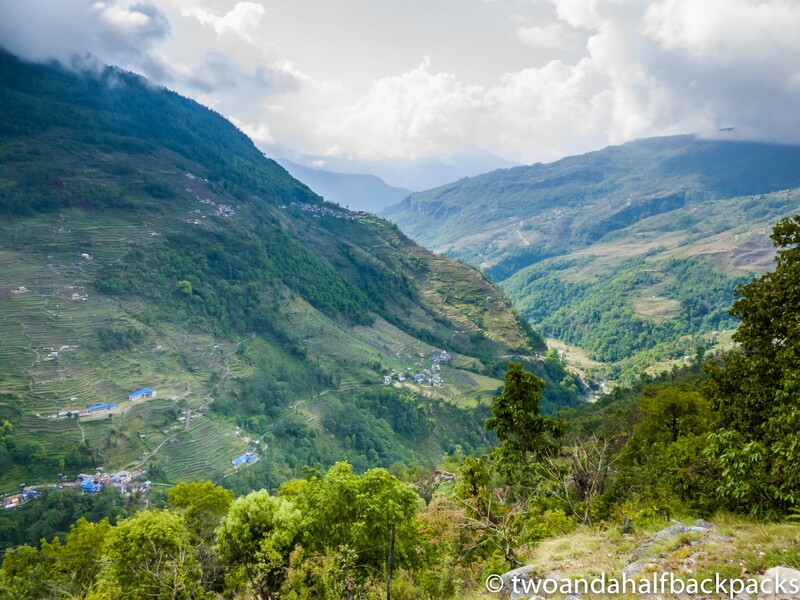 Although a thick layer of clouds and our low position deep within the valley precluded any stunning views, the expansive terracing and pastoral landscapes promised magnificent scenery as we climbed further in the coming days. 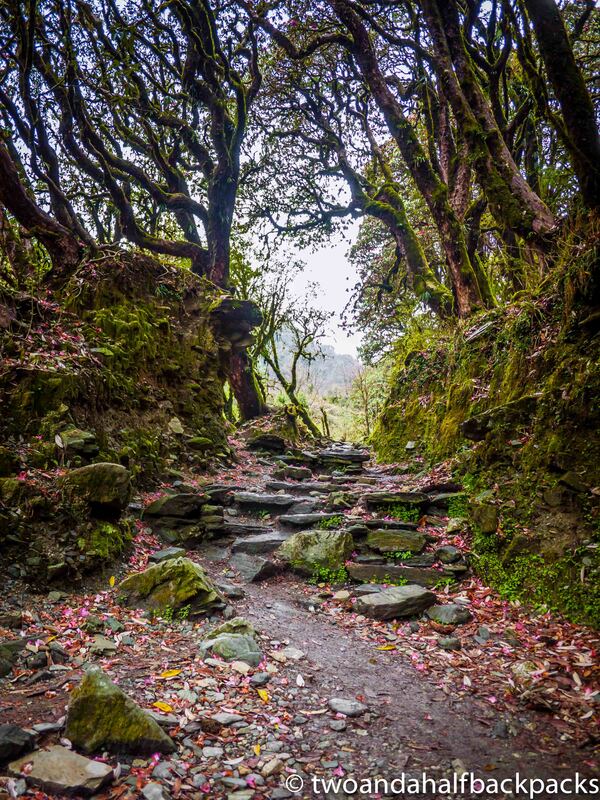 the trail begins as a road…. the scenery transitions to farms…. 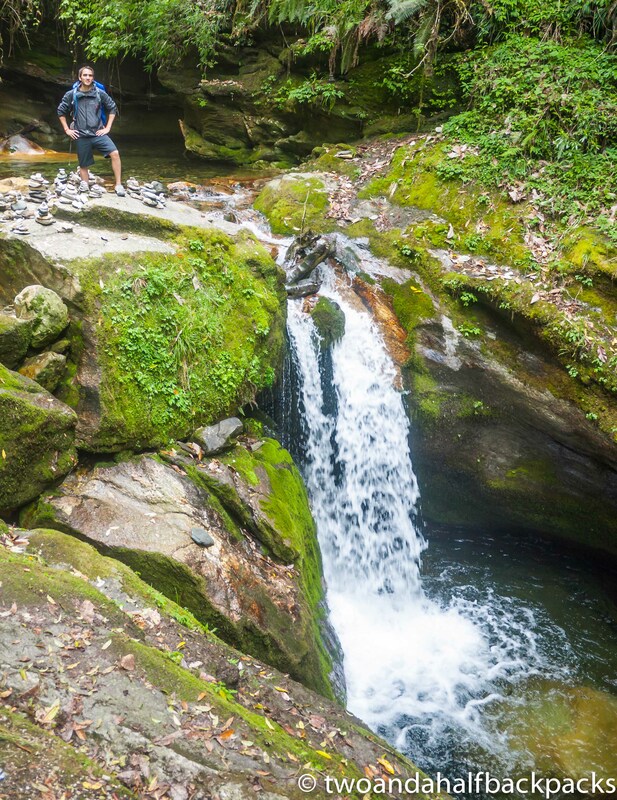 Due to our late start, necessitated by the travel and logistics of the morning, it was a leisurely day on the trail. When we reached Hile three and a half hours later, we had covered 10km (6 miles) and climbed 370 meters (1200 feet). Lodging consists of teahouses along the trail. Brightly painted and welcoming, they are actually little more than walls and a roof. There is no insulation or heating and due to wide gaps in the construction, the temperature inside and outside are essentially the same. A thin mattress is provided, but no bedding. Some rooms have electricity, i.e. a light bulb, and there is a communal toilet which may either be “Western” (flush), or more commonly, a traditional “squat.” Cold showers are usually available, although at times you can pay a few dollars extra for (luke)warm water powered by propane tanks the locals carry up and down the mountains. Still, the most important part of the stay–the food–is generally handled with aplomb. 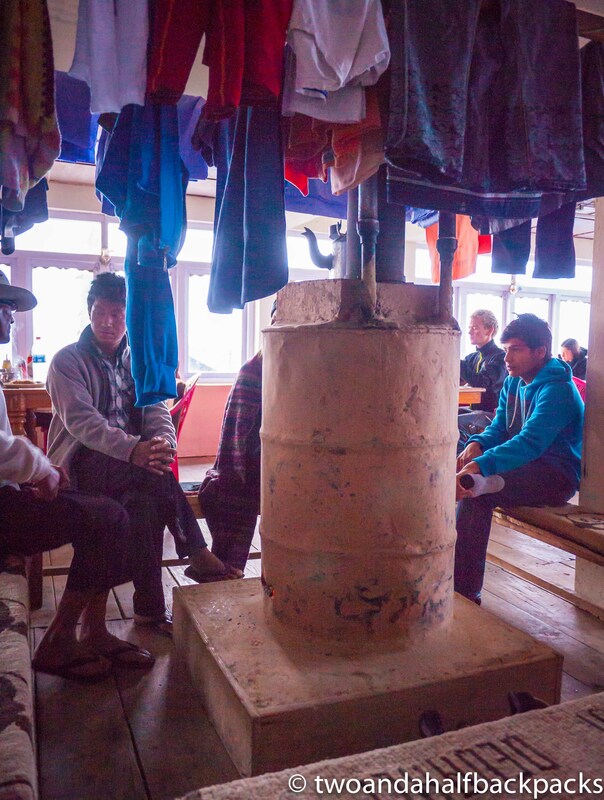 Local families run the teahouses and prepare authentic meals over traditional stoves. While the menus also contain some western options, the local Nepalese diet is an amazing blend of fuel and flavor. Dal bhat, the national dish of rice and lentils, sticks to the ribs in a way that provided us with the warmth and energy to attack the day’s hike. There is a reason that the porters and guides eat dal bhat for every meal, and we followed their lead. Because the recipe varies between families, we were able to sample different versions of the venerable dish at each stop. 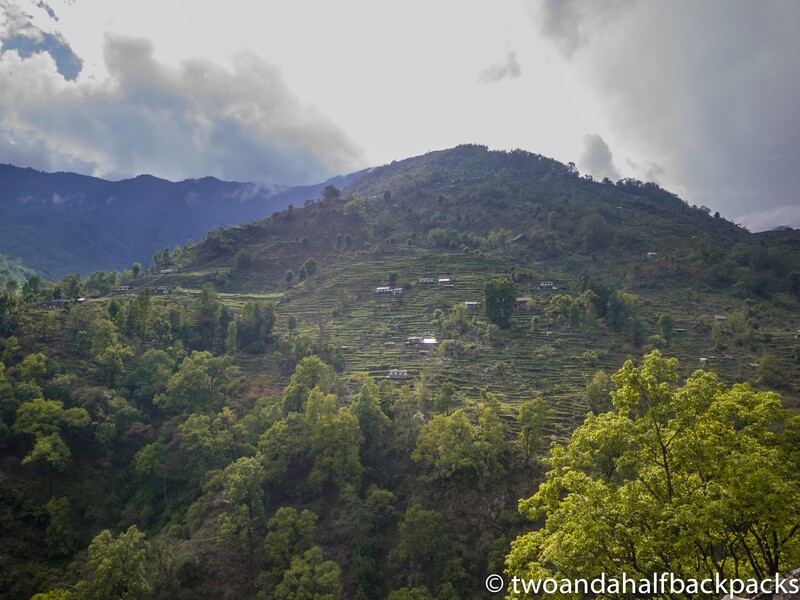 Dal Bhat is more than food, it is sustenance, friendship, culture, and, now, nostalgia; the thought of it always snaps my mind back to the Himalayas, our memories of the people, vistas, and food are so tightly intertwined. As the sun set, a few lights flickered on in the town, but they could not prevent the blackness from closing in around us. The temperature fell precipitously and the clouds and rain permeated the air with a raw dampness that chilled us to the bone. We migrated from the dining room to our mummy-style sleeping bags, now the best place to find warmth, where we slowly drifted off into restless sleep, our thoughts dominated by the days ahead. Having gone to sleep at nightfall, we woke up spontaneously at 5:30 the next morning. Sunlight was just peaking into the valley; our circadian rhythm had instinctively reset to nature’s clock. After a breakfast of porridge and eggs, we grabbed our packs and it was back to work on the trail. 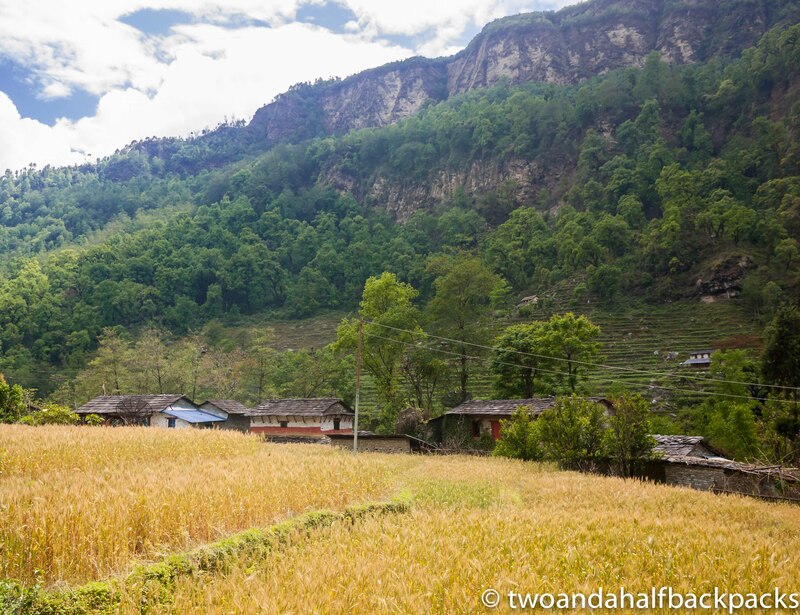 April in Nepal is considered “pre-monsoon”, which meant that early starts offered clear blue skies and uncompromised views before the inevitable mid-afternoon rains. 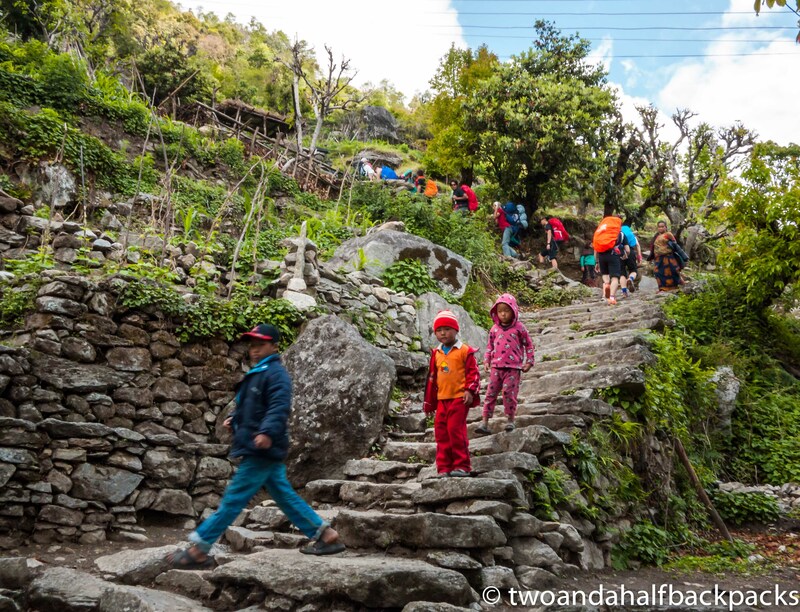 After passing out of Hile and through another small village, Tikhedunga, the path transitioned into a stone staircase leading UP. Depending on your source, there are between 3300 and 3750 stairs. For comparison, 1500 stairs gets you to the top of the Empire State Building (although you probably wouldn’t be wearing a backpack or struggling with the thin mountain air). 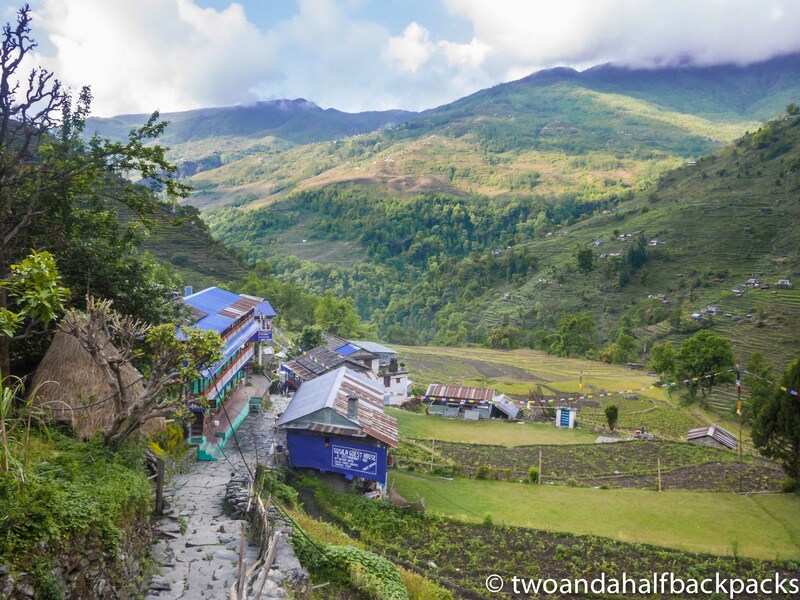 The sun beat down on us as we toiled along the exposed mountain ridge, the view of the valley expanding below us, endless terraced green hills broken by the occasional small farm and village. Unfortunately, our gaze was primarily fixed downwards, the sheer irregularity of the steps proving to be one of the most difficult aspects of the climb. 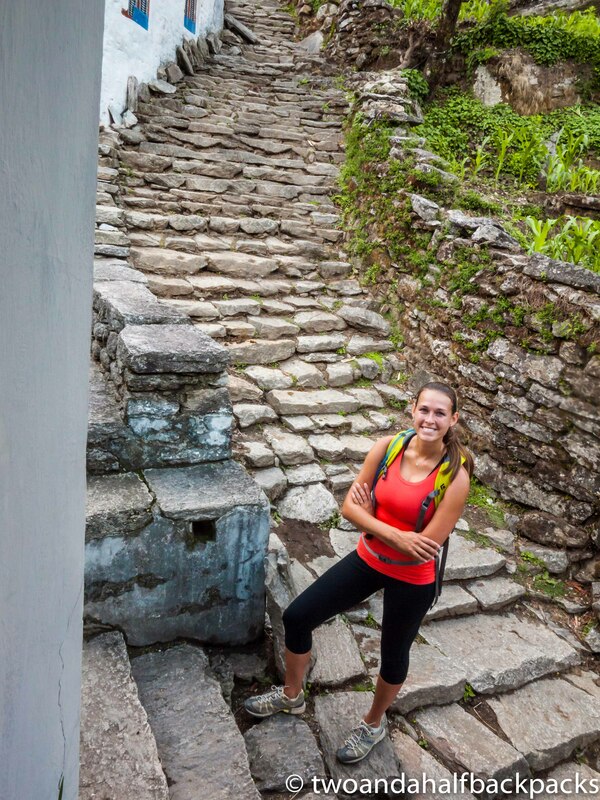 Built of loose rock and angled stone, the height of each stair varied from inches to feet, demanding total concentration with each step, and preventing us from building a steady rhythm. Minds and body equally weary, we stopped for dal bhat and another local staple: Nepali black tea. Dende had recommended it to us on the first day to combat our headaches, which were presumably brought on by the altitude. I had been skeptical, but was quickly converted. The tea cleared our migraines almost immediately and infused our tired limbs with belief. I was curious how the tea was cultivated and prepared, but never asked, as if the knowledge might somehow diminish its healing powers. 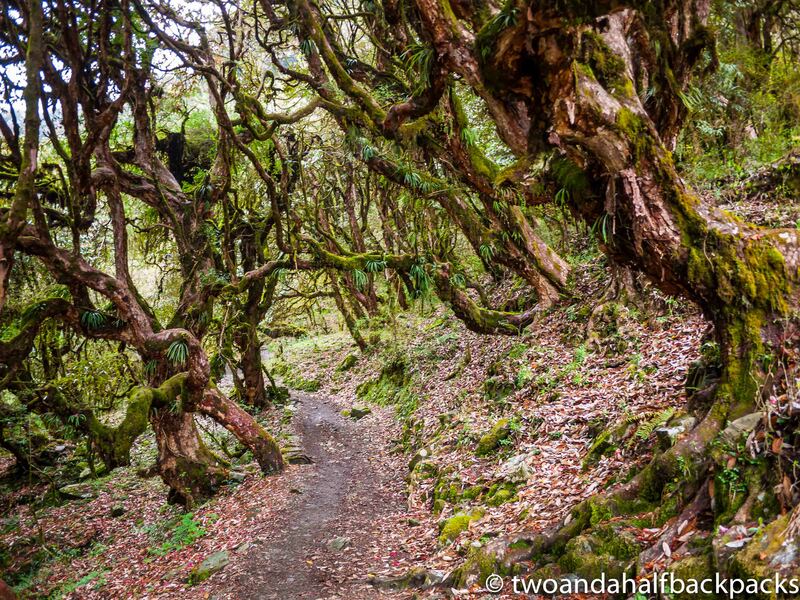 After ascending the stairs we were rewarded with rolling hills covered in an ancient rhododendron forest, its noble trees towering and twisting above the trail. Their flowers had just fallen, creating a soft carpet of vibrant petals beneath our feet as if someone had purposely scattered them before us. 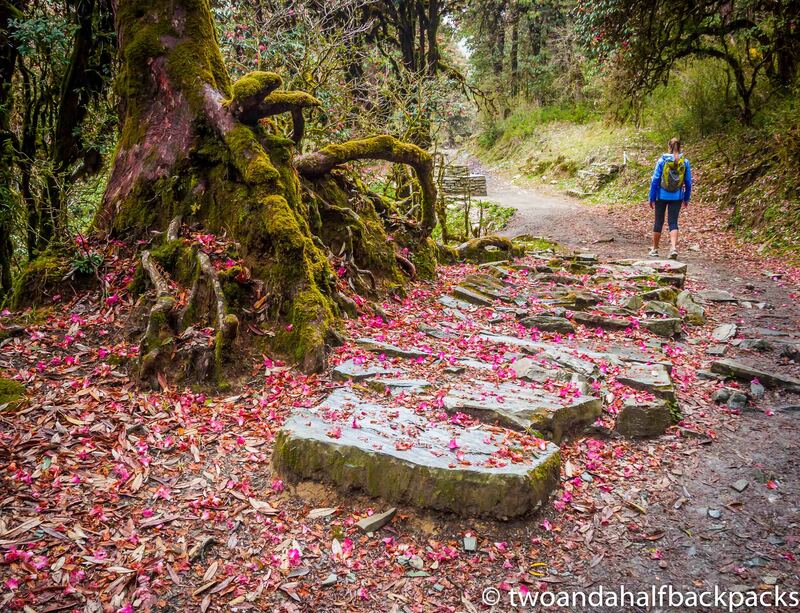 We continued to climb, reaching higher and cooler elevations where the rhodendrons remained in full bloom, painting the mountainside in huge swaths of reds, pinks, and oranges against the lush green backdrop. As the afternoon wore on, the clouds caught up with us, lending an eerie white haze to the forest that silhouetted the outline of trees and cloaked the hillsides in the distance. Sunlight shimmered and flickered through the clouds, deflected at odd angles by sinewy branches covered in thick layers of hanging moss. Our timing was perfect, and perfectly unplanned; an enigmatic fusion of the topography and the elements swirled around us in a dynamic, evolving scene. It was a surreal experience, and we were acutely aware that the moment was unique to our eyes alone. The precise conditions: the formation of the clouds, the angled rays of filtered sunlight, the strewn flower petals, and the walls of verdant color, could never be fully replicated. 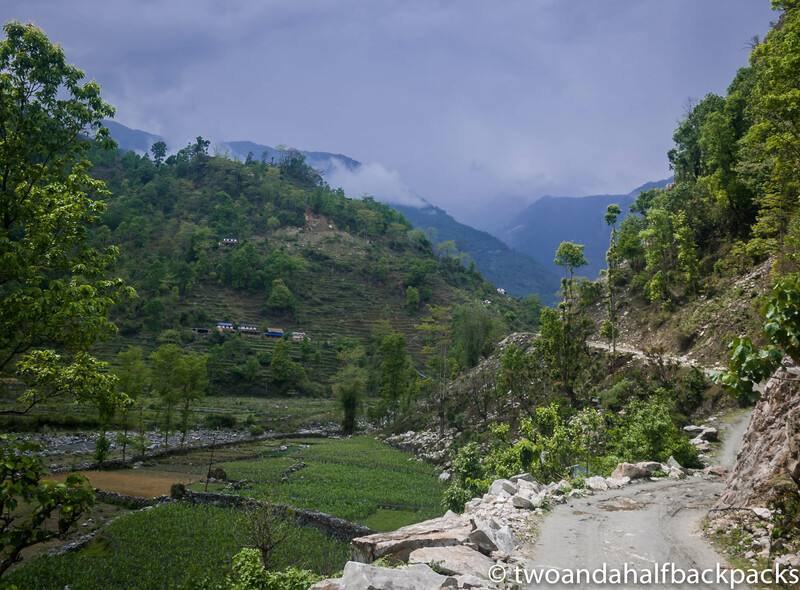 The rain returned as we approached Ghorepani. Our clothes became wet and heavy, each step now a reminder of how tired we were. 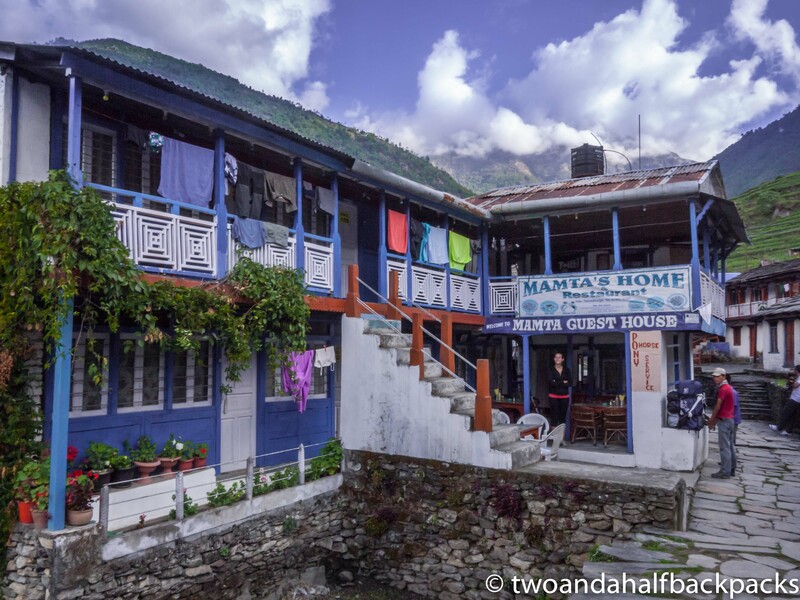 We arrived at the teahouse and settled in front of a large stove at the center of the dining room, where we warmed ourselves and dried our clothes alongside fellow trekkers, porters, and guides. We ate dinner amongst friendly faces, all drunk with fatigue and hypoxia, content simply in the knowledge that we had ten hiking-free hours ahead. Endorphins circulated through our bodies and we savored the purity of total exhaustion before the pain and soreness set in to our muscles. We went to bed early again, hoping deep sleep would inspire a rapid recovery. The hardest days still lay ahead. 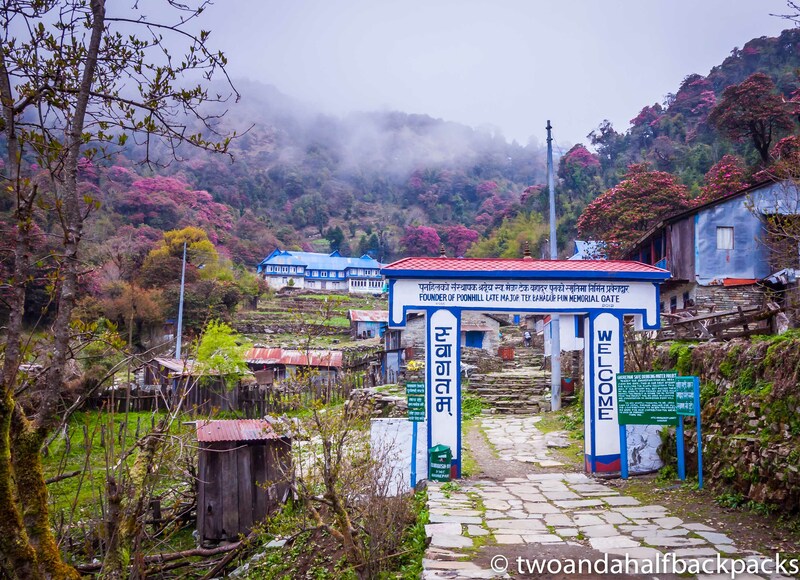 This entry was posted in Uncategorized and tagged Annapurna Base Camp, flowers, Ghorepani, Hile, Nayapul, rhododendron by chris. Bookmark the permalink. What an epic trip in a place that will take many, many years to recover. I have friends that also went this spring and it’s been tough for them since they have friends there. Thank you. Yes, it is an unbelievable trek. Hopefully the smaller towns and villages escaped serious damage, but I can’t imagine that. At least those whom we met are safe, but you are right–it will be a long, slow recovery.